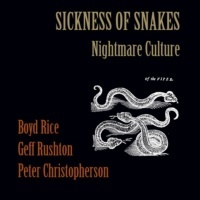 Nightmare Culture features the tracks recorded by Coil and Boyd Rice under the name Sickness Of Snakes. The three tracks originally appeared on one side of Nightmare Culture, a split LP with Current 93. The other side featured 'KillyKillKilly (A Fire Sermon)', a side-long track from 93 Current 93, which also featured both John Balance/Geff Rushton and Boyd Rice in the expansive line-up. Sickness of Snakes formed after Geff and Sleazy (who Boyd had known since meeting Throbbing Gristle years before) invited Boyd, a pioneering noise musician, to collaborate. Recorded and mixed over the course of a 9 hour session, the three tracks hark back to the early days of Coil when porcine culture, Icelandic rune lore (the name Sickness of Snakes was lifted from the Icelandic poem Hagal), surrealism and delirium seeped into their early mythology. Listening back to this now the Sickness Of Snakes tracks recall the sombre moments of Scatology (think 'At The Heart Of It All') and appears as almost tentative steps into what would become the rejected themes for Clive Barker's Hellraiser movie. You can hear it in the structure of 'Various Hands' with its ominous sounding synths and horror strings and the creeping synth stabs on 'The Swelling Of Leeches'. That however only gives half the picture. 'Various Hands' bursts into explosions, shattering glass and flying debris, while 'The Swelling Of Leeches' opens to a barrage of noise, roaring gongs and squeals before settling into a marimba type score punctuated by horns and ominous keyboards. You, like I, may have attributed those noise samples on 'Various Hands' to Boyd Rice but in the accompanying sleevenotes Boyd Rice claims those samples were found on the Fairlight following a recording session by Kate Bush! The final piece captures the collaborators at their most abstract and their most surreal. Based around treated pig sounds, 'The Pope Held Upside Down', much like Boyd's output as NON from around the same time, forces the listener to impose some sort of interpretation on the babbling pigsqueal. Boyd Rice and Coil were never to collaborate again - though Sleazy and Boyd Rice both featured separately on Hirsute Pursuit's Tighten That Muscle Ring. Nightmare Culture captures a time when Coil were prone to collaboration, in an attempt to seek other energies and perspectives. It would have been good if this EP had featured 'His Body Was A Playground For The Nazi Elite', their other collaborative track recorded at the same session but curiously not mentioned by Boyd Rice (even though it's included on Boyd's Easy Listening For Iron Youth as 'Predator/Prey') in the essay in the accompanying booklet (featuring rare photos), that recalls his early friendship with Coil.